July 1st 2017 – This month we’re working with Trading Standards to raise awareness of scams and how to protect yourself from people up to no good. Scams come in all shapes and sizes, cunningly planned and perfectly executed with just one objective in mind – to take your money! 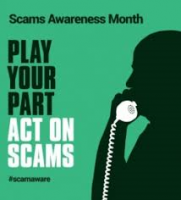 We want to encourage you to protect yourselves and others by spreading the message about some key steps we can all take to avoid getting caught by scammers. She said that the scammers will target anyone; the vulnerable, the elderly, the young, employed, unemployed, adding, “scammers are not fussy who they target and they are getting braver”. An emailer knows your address but not your name? Does an email begin with something vague like ‘To our valued customer’? Have you been contacted by a lottery or competition that you’ve never heard of? Is a company asking you to send money in advance or are you being asked for personal and security details? Are you being urged to respond quickly to an offer so you don’t get time to think or talk to family and friends? Has a business that’s contacted you only got a web-based email address such as gmail or yahoo? If you’re not quite sure find the official company website or customer support number using a separate browser and search engine. You can always check a company (Ltd or PLC) on the Government Companies House listing or type the name into a search engine to see what other people may have already experienced. Don’t be fooled by IT experts offering to remove computer viruses. A simple response to persuasive sales patter is just to say, “No thank you”.